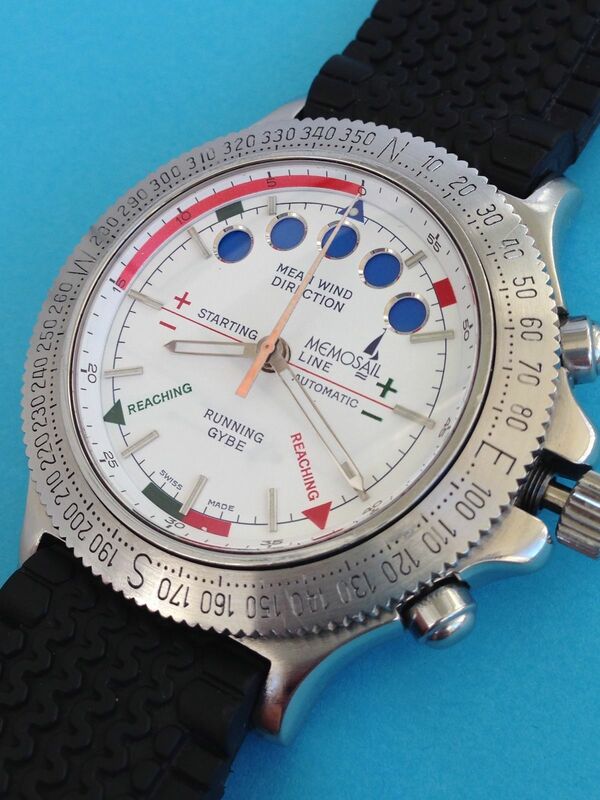 Mid 1980′s a new Memosail with an automatic regatta movement was introduced: the Memosail Automatic . 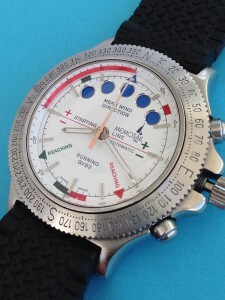 The successor of their Valjoux 7737 movement is the Valjoux 7757, based on the caliber 7750 with a regatta module integrated from Dubois-Dépraz. 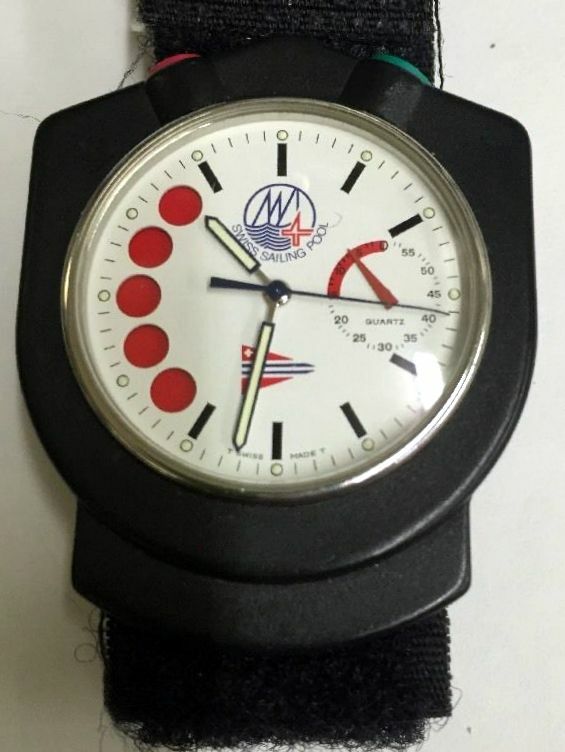 This model has a rotating compass bezel and the Paul Elvström tactical system printed on the dial. You can read here how that works. All watches are engraved on the caseback with an individual number (eg. 1-576). 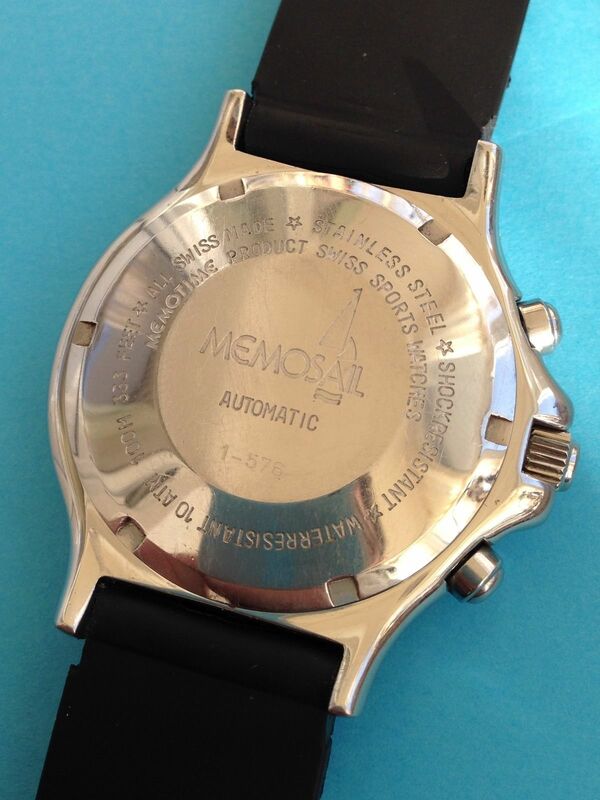 Memosail automatic with Valjoux 7757 movement and numbered caseback. Reference: 2551 stainless steel case, white dial and leather strap. 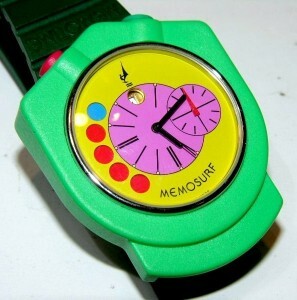 2554 goldplated stainless steel case, white dial and leather strap. 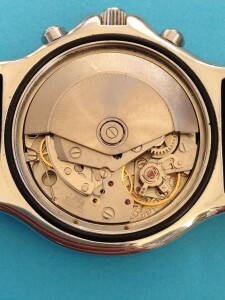 Caliber: automatic Valjoux 7757 movement with a Dubois-Dépraz regatta module. The Valjoux 7757 regatta movement was used in the 1980´s in the Atlantic Skipper, the Eberhard Azzurra, the Wyler Vetta La Giraglia and the Memosail Automatic. 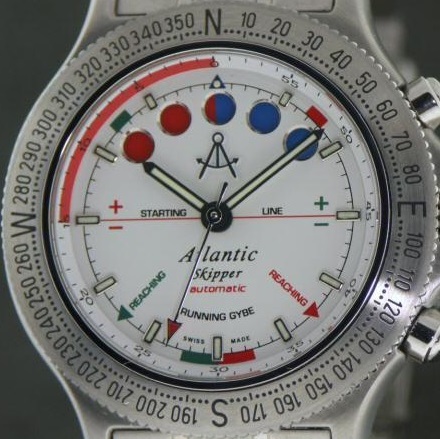 More information and details about the caliber 7757 can be found at the Atlantic section here. 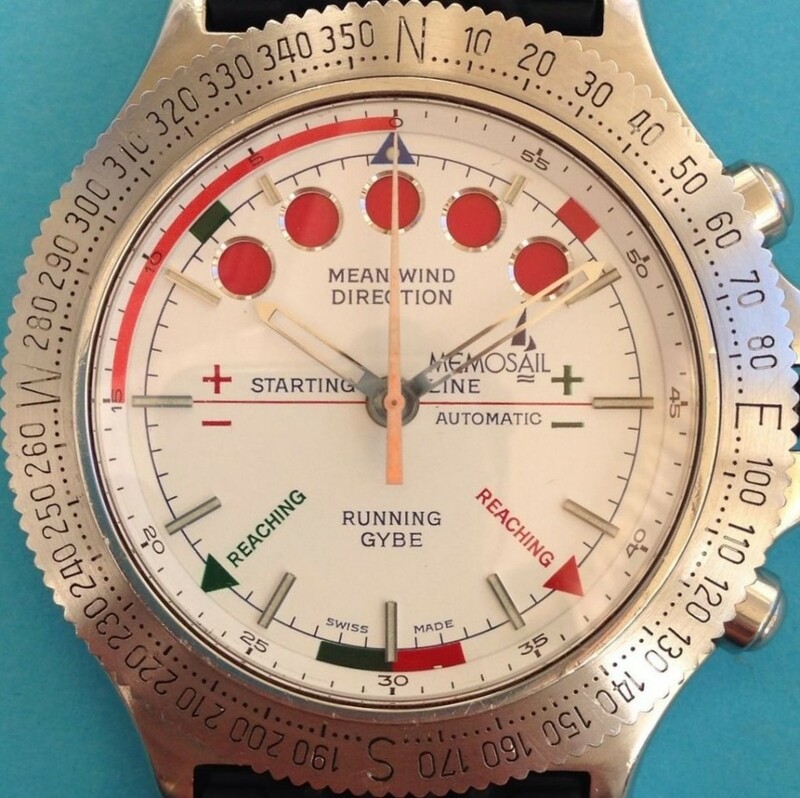 1980’s Memosail Automatic and Atlantic Skipper, both with a Valjoux 7757 movement and resembling dial and bezel. In 1989, at the European Watch Clock and Jewellery fair, Memotime introduced a series of colourful countdown watches named Memosurf and Memosail-fun. All of these watches are housed in a carbon fibre case, driven by the earlier double quartz movement (Ronda quartz 775 with the Memosail 883 countdown module) and with a matching coloured strap signed Memotime. Rather than use a traditional layout with the crown and pusher placed on the right side, the movement is rotated 90º inside the case repositioninng the crown and pusher at 12 o’clock, resulting in the ‘Bullhead’ layout as seen in vintage chronograps by Breitling, Seiko and others. 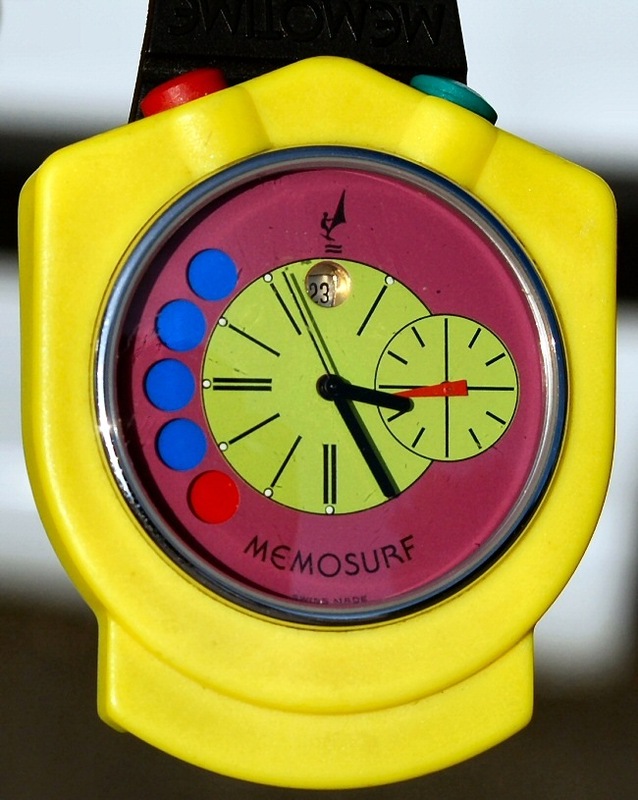 Memosurf in yellow and green, with black hands. 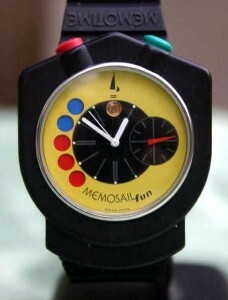 Memosail-fun in black and blue, with white hands. 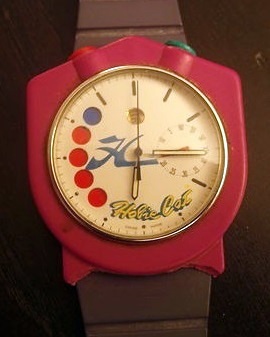 Obviously some Special Editions where made as well. 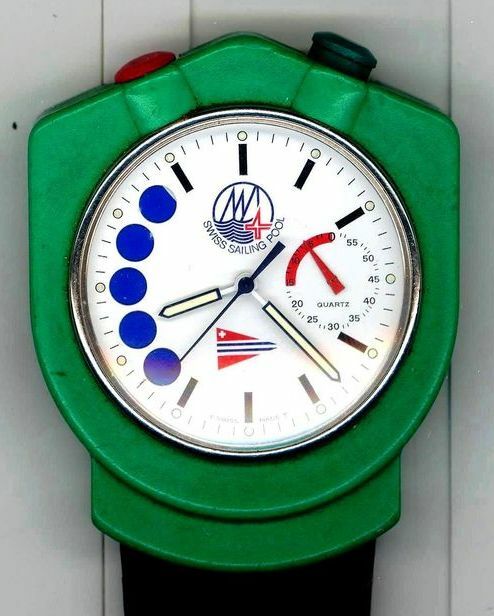 Here a red version for HobieCat, and a black and a green version both for the Swiss Sailing Pool. All three with different hands. In 1992 Memotime was the official sponsor for the America 3 in the America’s Cup. 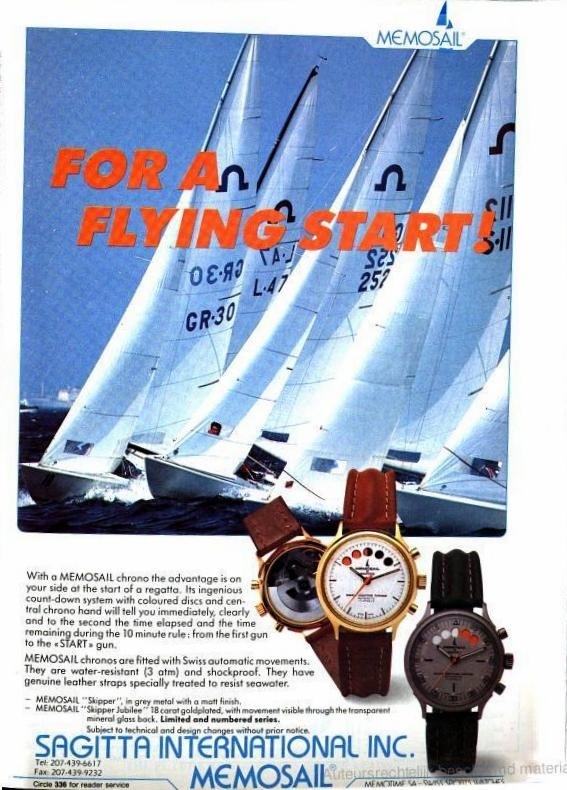 Ad for the Memosail Skipper in the US magazine MotorBoating feb-jun 1990. This is the end of part 2. 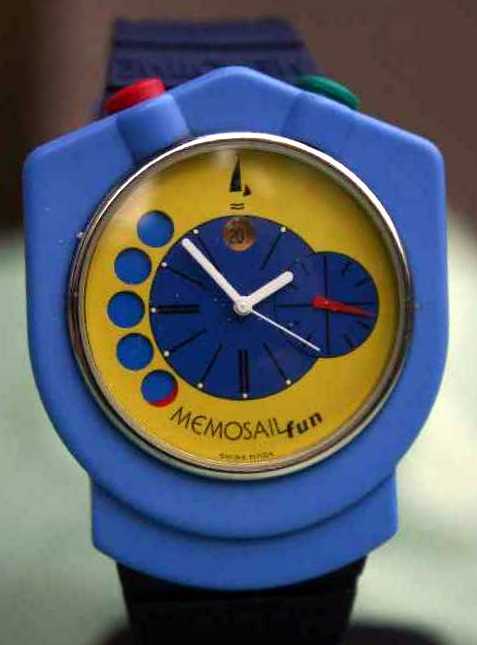 To be continued in the Memosail 2000 – 2015 section.